Low body fat masses of elite female gymnasts are favoured for the current aesthetic appeal required for complex movements performed by the gymnasts. Optimal nutritional intake relative to physical training regimes is essential for pubertal development. Here we evaluate how high intensity training in combination with nutritional intake affects pubertal development. Twenty-two female (13.6 ± 1.0 years) and 18 male (12.4 ± 1.6 years) elite gymnasts from national cadres were enlisted in this study. Skeletal maturation and hormonal levels of the hypophyseal, gonadal, and adrenal axes were estimated. Prepubertal and pubertal stages were determined, and body composition was measured using two indirect methods. Whereas female gymnasts showed bone retardation (1.7 years), reduced height potential, minimal fat mass (4.3 ±1.3 kg), no significant increase in pubertal oestradiol levels (17.6 ± 4.2 pg/ml vs. 23.9 ± 13.4 pg/ml), and delayed menarche (2.3 years), male gymnasts displayed virtually unaltered pubertal development due to different training regimes. 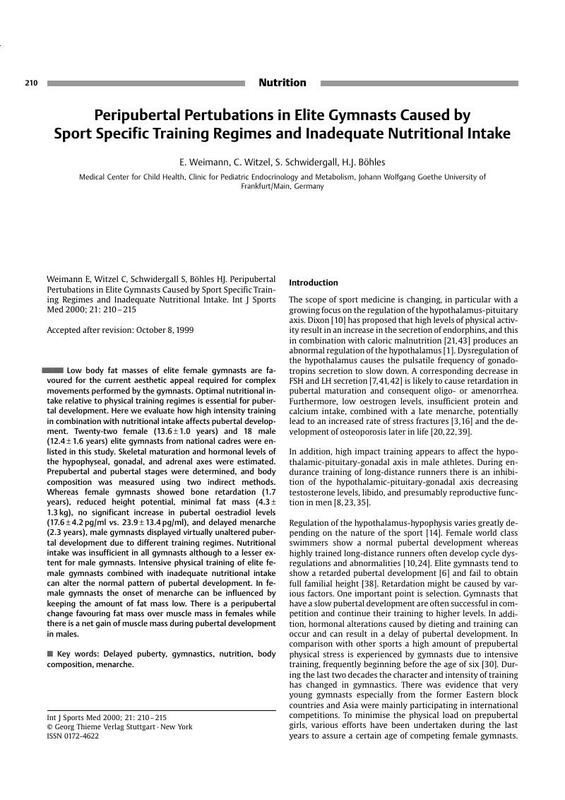 Nutritional intake was insufficient in all gymnasts although to a lesser extent for male gymnasts. Intensive physical training of elite female gymnasts combined with inadequate nutritional intake can alter the normal pattern of pubertal development. In female gymnasts the onset of menarche can be influenced by keeping the amount of fat mass low. There is a peripubertal change favouring fat mass over muscle mass in females while there is a net gain of muscle mass during pubertal development in males.